So I've now talked to all five of my lovely bridesmaids (for my August 6th wedding) and they've picked their dresses for the wedding. I'm going to be making them, of course! =), and wanted my friends and future sisters-in-law to chose something they like within a general sort of vibe. I'm actually having a bit of a conflict, since originally I was all about a J.Crew-ey look, mmmmmm wonderful stuff in their bridal/formalwear. But now I'm thinking I may go more vintage-ey, and am decorating with milk glass vases and vintage quilts. I look at photos of weddings where the bridesmaids wear vintage pastel, full-skirted dresses, and they're so pretty! But I don't think I want to go quite that far. Here's where we started, though: I pulled out pages from J.Crew's wedding stuff, and collected fabric swatches (I THINK I want them in pale grey, although purple was my preference at one point...). I collected some of my patterns that are similar styles to the J.Crew dresses. I was imagining doing a pleated, tapered skirt like a paper bag skirt on all the dresses, with different tops. 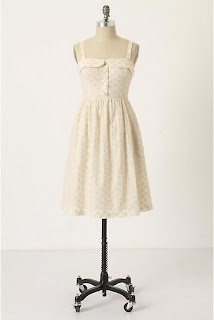 Or, I could go even more retro, and give it a longer full skirt, just a classic. Like this cute summery Anthro dress. Anyway. Still lots to decide, but I have time. The main thing is deciding on the theme/feel I'm going for, and I like too many types. Modern, funky, retro, romantic, outdoorsey... I like them all. Working on developing my own hybrid, I guess! Oh I love when bridesmaid dresses aren't totally 'matchy match'. You've probably already seen this but www.ruffledblog.com is also great for diy-style wedding inspiration! all your ideas sound great! haha and that picture of those bridesmaids is where i got married too! lovely. you love them all you can o them all! You are a peson who can see or have a vision and make al of these different styles work well and together...so don't settle for one when you can have it all beautifully! It's one day fo a lifetime so just make sure not to strss aout the small stuff an do what you day=rock it! best of luck =) Enjoy it all! woww you a doing a great job! Cute! 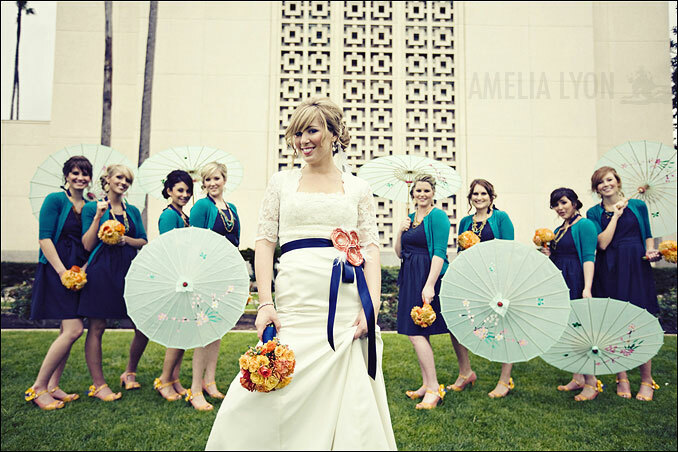 The big question is: what do your bridesmaids think? Trust me, that can be the hardest part! If you go with pale grey then some fun colors are a must for accessories! =) Looking forward to seeing what you decide - I'm sure it will be so beautiful. I like the banana republic one. I can't believe you're making the dresses. You're going to be one busy bride. i love your inspiration photo! i did the same thing with my bridesmaids (only, we just bought j.crew...i'm not that talented of a seamstress!) 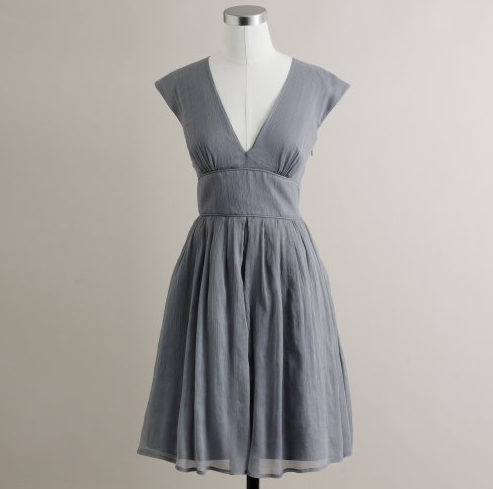 they all wore the grey chiffon, but all wore different styles of dresses. then they each wore their own red shoes and for part of my bachelorette party, we went and made necklaces for them to wear. i LOVED the overall look! i also did milk glass vases! if you are by any chance looking to buy a bunch all from one place, let me know! (email is best at southwind (dot) design (dot) studio (at) gmail (dot) com) they are all currently residing my my in-laws shed...as we have no place to store them right now. :) i had SO MUCH FUN collecting them all! 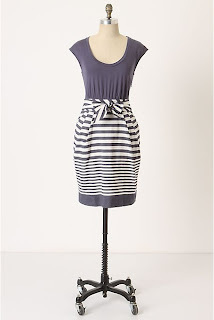 Ummmm I love that j crew dress!!! I have to pick up a grey dress for a wedding I am in this fall and want that one! Do you know the name or style number? Hopefully I can still pick it up!